It is already the 6th consecutive year that MarketKey organized the Product Innovation conference with its primary roots in PLM. For me, the PI conferences have always been a checkpoint for changes and progress in the field. This year about 100 companies participated in the event with the theme: Digital Transformation. From Hype to Value? Sessions were split into three major streams: digital transformation, extended PLM, and Business Enabled Innovation larded with general keynote speeches. I wanted to attend all sessions (and I will do virtually later through PI.TV), but in this post, my observations are from the event highlights from the extended PLM sessions. Giorgio Metta gave an overview of the RobotCub project, where teams are working on developing a robot that can support human beings in our day-to-day live. Some of us are used to industrial robots and understand their constraints. A robot to interact with human beings is extreme more complex, and its development is still in the early stages. This type of robot needs to learn and interpret its environment while remaining accurate and safe for the persons interacting with the robot. One of the interesting intermediate outcome from the project is that a human-like robot with legs and arms is far too expensive and complicated to handle. Excellent for science fiction movies, but in reality too difficult to control its balance and movements. This was an issue with the iCUB robot. Now Giorgio and the teams are working on the new R1 robot, maybe not “as-human” as the iCUB robot, but more affordable. It is not only the mechanics that challenge the researchers. Also, the software supporting the artificial intelligence required for a self-learning and performing safe robot is still in the early days. An inspiring keynote speech to start the conference. The first Extended PLM session was Guido Klette (Rheinmetall), describing the challenges the Rheinmetall group has related to develop and support PLM needs. The group has several PLD/PLM-like systems in place. Guido does not believe in one size fits all to help every business in the group. They have already several PLM “monsters” in their organization. For more adequate support, Rheinmetall has defined a framework with PLM components and dependencies to a more granular choice of functionality to meet individual businesses. A challenge for this approach, identified by a question from the audience, is that it is a very scientific approach not addressing the difference in culture between countries. Guido agreed and mentioned that despite culture, companies joining the Rheinmetall group most of the time were happy to adhere to such a structured approach. My takeaway: the component approach fits very well with the modern thinking that PLM should not be supported by a single “monster” system but can be addressed by components providing at the end the right business process support. Björn Axling gave an excellent presentation describing the PLM perspective from the Husqvarna group. He addressed the external and internal challenges and opportunities for the group in a structured and logical approach which probably apply for most manufacturing companies in a global market. 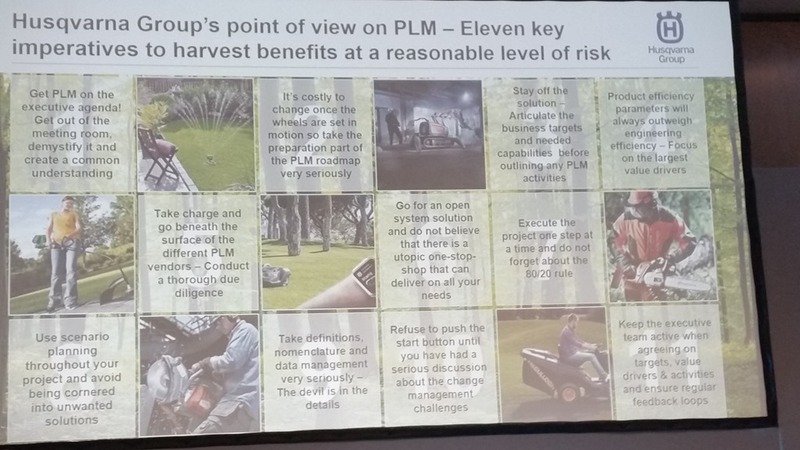 Björn explained that in the Husqvarna group PLM is considered as a business approach, more than ever, Product Lifecycle Management needs to be viewed as the DNA of a company which was the title of one of his slides. Take definitions, nomenclature and data management very seriously – the devil is in the details. This point will always fire back on you if you did not give it the needed attention from the start. Of course, the other ten points are also relevant. The challenge in every PLM project is to get these points addressed and understood in your company. How to use PLM to enable Industry 4.0? Martin Eigner´s presentation was building upon his consistent messages that PDM and PLM should be evolving into SysML with a growing need for Model-Based Systems Engineering (MBSE) support. The title of the presentation was related to Industry 4.0 more focusing on innovation in for Germany´s manufacturing industry. Germany has always been strong in manufacturing, not so strong in product innovation. Martin mentioned that later this year the German government will start another initiative, Engineering 4.0, which should be exciting for our PLM community. Martin elaborated on the fact that end-to-end support for SysLM can be achieved through a backbone based on linked data. Do not try to solve all product information views in a single system is the lesson learned and preached. 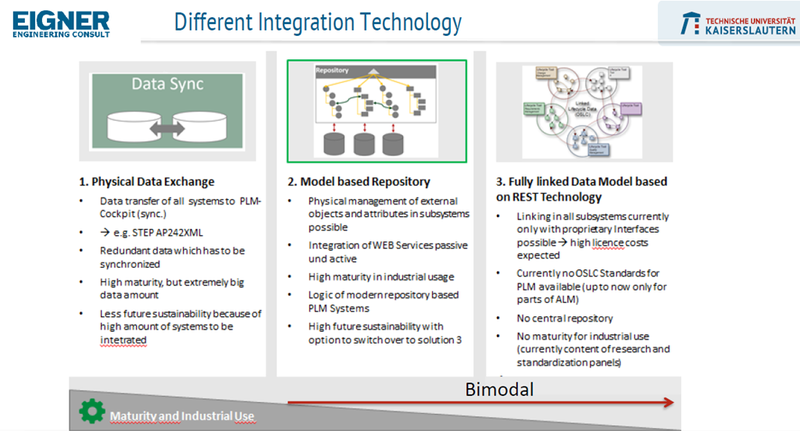 For me, it was interesting to see that also Martin picked up on the bimodal approach for PLM, required to support a transition to a modern digital enterprise (see picture). We cannot continue to build upon our old PLM environments to support, future digital businesses. In my afternoon session (Jos Voskuil), I shared the observations that companies invest a lot in digital transformation downstream by introducing digital platforms for ERP, CRM, MES and Operations. PLM is often the forgotten platform that needs to change to support a digital enterprise with all its benefits. You can see my presentation here on SlideShare. I addressed here the bimodal approach as discussed in a previous blog post, introduced in Best Practices or Next Practices. In case your company is not ready yet for a digital transformation or bimodal approach I addressed the need to become model-driven instead of document-driven. And of course for a digital enterprise, the quality of the data counts. I wrote about these topics recently: Digital PLM requires a Model-Based Enterprise and The importance of accurate data: ACT NOW! The last extended PLM presentation from day 1 was given by Felix Nyffenegger, professor for PLM/CAx at HSR (University of Applied Science in Rapperswil (CH)). Felix shared his discovery journey into Industry 4.0, and IoT combined with experiences from the digitalLab@HSR, leading into the concept of closed-loop PLM. 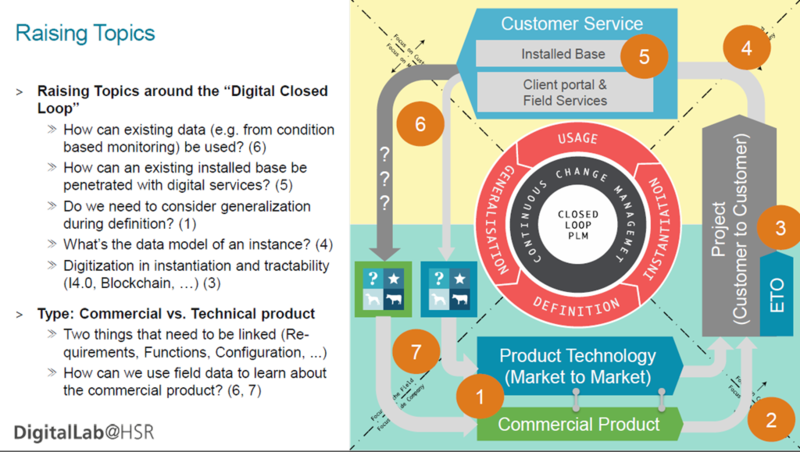 I liked in particular how Felix brought the various views on the product together into one diagram, telling the full story of closed-loop PLM – necessary for a modern implementation framework. 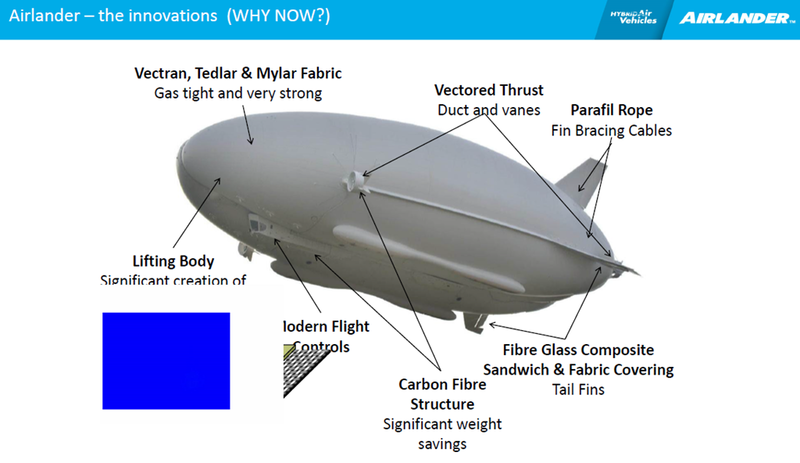 The last presentation of the day was from Chris Daniels describing the journey of Hybrid Air Vehicles with their Airlander 10 project. Where the classical airships, the most infamous perhaps the Hindenburg, have disappeared due to their flaws, the team of Hybrid Air Vehicles built upon the concept of airships in a defense project with the target to deliver a long endurance multi-intelligence vehicle. The advantage of airships is that they can stay in the air for several days, serving as communication hotspot, communication or rescue ship for places hard to reach with traditional aircraft or helicopter. The Airlander can be operation without going back to a base for 5 days, which is extremely long when you compare this to other aircraft.